A Shepherd's Heart: Stop Remembering What God Has Forgotten! We all we all sin. But because Jesus was the ultimate sacrifice and payment that satisfied God’s wrath by His death on the cross! He died for our sins and then He rose from the grave, every one of our sins past present or future has been paid in full through what He did for you and I! Don’t let shame and guilt keep you from walking in God's love and forgiveness daily! Since God has removed your sin from His memory – He doesn’t hold your sin against you any longer if you’ve received His gift of salvation! If you have receive His salvation then isn’t it time you do the same and move forward with God fully embraced by His love and mercy? He wants to use you and He loves you with a perfect and unconditional love. Don’t allow your past or the evil one’s influence cripple you any longer and let God’s love wash over you! Now, today, if you're actively and willfully sinning....STOP! Repent from your sin and move forward in the same before mentioned truth! He doesn't want you to live a defeated or crippled life anymore do the past or present sin because He already won victory over sin on the cross so let's start living and walking in His truth! Something to think about today and if you’re struggling with letting go of the past, letting go of the sins you’ve already been forgiven for, let me encourage you to seek Him about this as He can and will help you move forward! 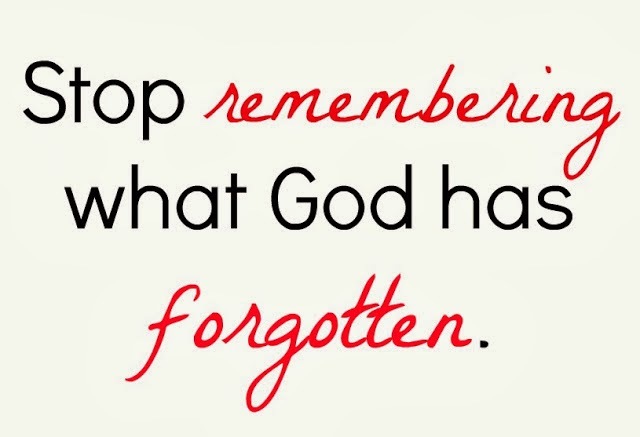 So, STOP remembering what God has forgiven and forgotten! Make this your prayer today!